We had a marathon Hall of Fame day! We visited both of these places in one day. Football Hall of Fame is in Canton and Rock and Roll is in Cleveland, one hour away. We started with football because they opened at 9:00 and closed the Rock nRoll at 9:00. I enjoyed both of these Hall of Fame. I don’t know much about football but learned quite a bit about the history. Watched video clips of some games and asked Alex is he is sure he wouldn’t rather run cross country in the fall instead of football. I LOVED the Rock and Roll Hall of Fame! There was so much to see, I could have spent much more time there. It really traces the history of RR and from its roots in gospel and the blues to the differnt types of rock today. There were so many interesting stories, videos and memorabilia. I could reach out and touch Bono’s guitar that he wrote early U2 songs on (I didn’t because I would get kicked out but I could have!). There was a guitar that belonged to James Taylor that was painted blue by his brother Alex. I am guessing things weren’t too quiet around the Taylor household when that happened. As we left and we were talking about what we had seen that day. 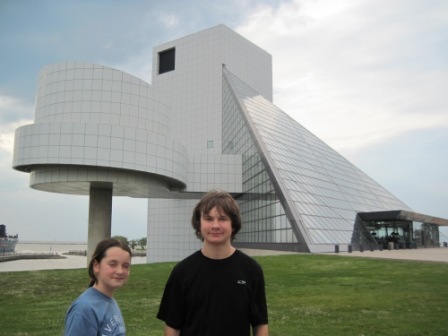 When I said how much I enjoyed the Rock n Roll hall of Fame the kids said well that makes sense because you lived it. 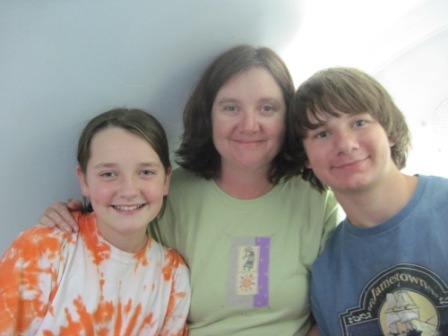 Hmmmm….I am not that old. I guess I shouldn’t have told them all of the concerts I had been to by people in the museum. We have a few more entries to go! Today was very busy; we went to two major halls of fame, the Rock and Roll and the Football Halls of Fame. 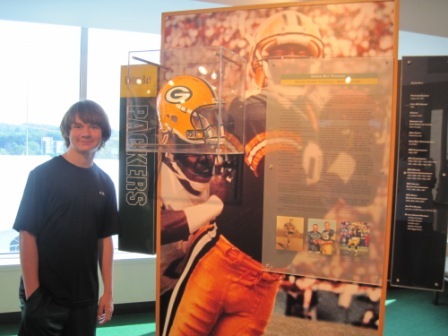 First we went to the Football Hall of Fame; there was a lot of stuff. There were a lot of items from back when the NFL started, like their nose guard; I thought it made the person look like it had the face of a dog. There were old uniforms and a lot of creepy looking manikins wearing them. I really didn’t understand a lot of it because I don’t understand football so the positions meant nothing to me. I did like seeing the busts in the actual hall of fame part. I recognized some of the people, like the guys that went on to be coaches or sports reporters, I liked seeing the different styles of hair. At the end of the hall of fame there is a room with all the Madden games in it and something were you try to throw a football through a hole in a net. Surprisingly, I actually managed to somehow get the football through the net. I really enjoyed the football hall of fame. 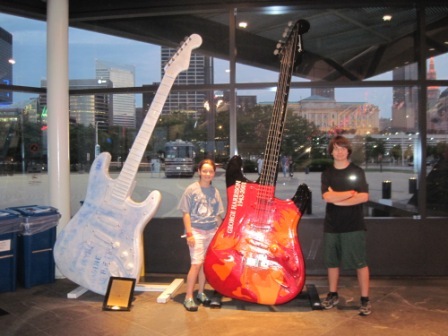 Second, we went to the Rock and Roll Hall of Fame. This hall of fame was much bigger with a lot more stuff. I learned all about the beginning of rock and roll and who helped start it. There was a cool computer that had all the branches on who influenced who in the making, like Patti Smith influenced U2. As we went throughout the museum I recognized some of the song and some of the artists, mostly the songs. I did look at the outfits and I must say, some of them were pretty whacky looking and the guys were wearing dress looking outfits. I liked watching the different videos of concerts and shows. I liked watching a U2 concert for when they got chosen to be in the hall of fame and he played with Patti Smith, Bruce Springsteen, Fergie. I thought it was cool when we got to see Johnny Cash’s tour bus. 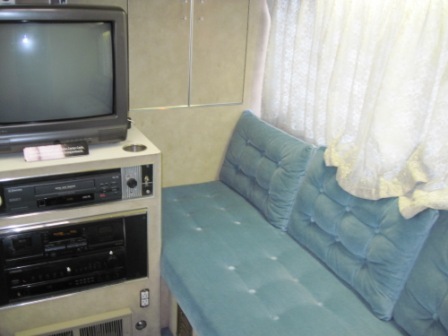 I would have much rather traveled cross country in his bus. I really enjoyed both Halls of Fame. 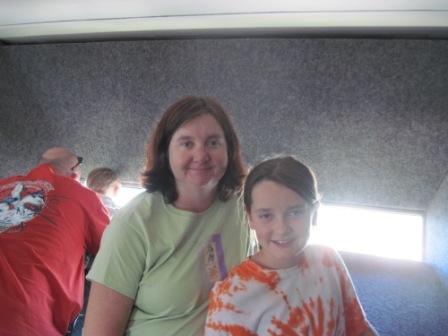 Inside Johnny Cash’s bus, why would Erin pass up a tent for this? Today we went to the Football Hall of Fame. It was really cool. When we first went inside we went to the history of professional football. We learned that football started at colleges. Then people started playing it professionally. 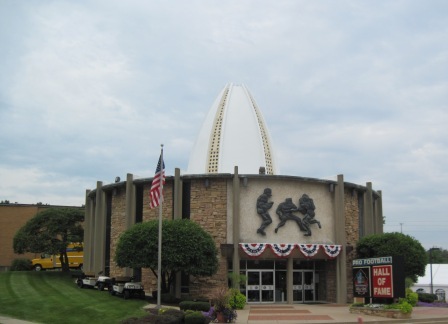 The first professional football game was in Canton, OH that is why the hall of fame is in Canton. After we went through the history section, the museum had a room with all of the teams and stuff about them. While we were in the room with all the teams they did a special presentation. They had lots of cool stuff. They had a 100 year old elbow pad from the first professional football player. They also had a pair of cleats used in the movie Leatherheads. 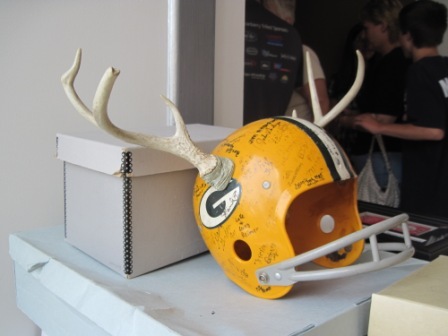 They coolest thing they had was a Packer Hemet with deer horns on it and it was called a Packalope. A fan made it wore it to the games and had it signed by other fans. 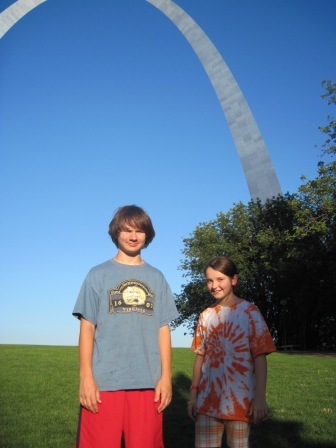 Today we went to the St. Louis Arch it was really cool. It was a lot bigger than I thought it was. It also does not go over the river like I though it did. We were going to go to the top and do the river tour. But, we could not do the river tour because the river was too high. It flooded the road in some places. So we just went to the top of the Arch. To get to the top you ride in an egg shaped tram that goes up inside the arch. It was really cool. From the top we could see into the baseball stadium. We could also see how high the river was. The ramp onto the dock for the river boats was under water. The ride down on the tram was faster than the ride up. Tomorrow we go to the Football and Rock and Roll Halls of fame. 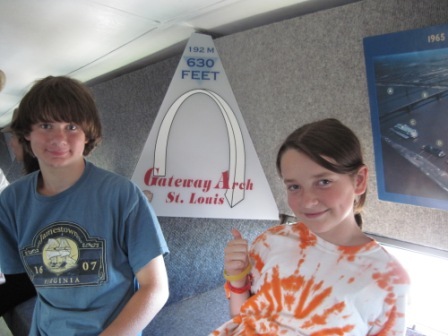 Today we went to the St.Louis Arch. We had to drive about eight hours to get there. It was awkward going from the middle of nowhere to a big city. The arch was bigger than I thought it would be. We decided we would definitely go up in the tram. The tram is tiny and egg shaped stuffed with five people per cart, attached to a train like machine that carries 40 people in all. The top was very crowed and hot. The windows were tiny, just enough to see the city. At that point, we were 630 feet in the air. People were like tiny little ants, running around a field. I thought it was entertaining watching them run around and swim in roof top pools. The view was amazing; we could see the whole city from up there. The tram ride down was a minute faster, making the ride three minutes long. I was disappointed to leave. The whole arch was opposite to what described in the book I read, Percy Jackson and the Olympians that is all about the Greek gods and their myths. 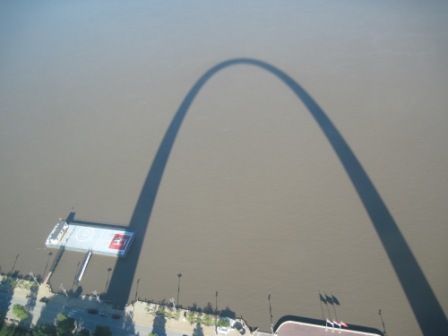 In the book, the main character, Percy, goes to the St. Louis Arch. In the book they use an elevator instead of a tram. When he got to the top, he had to jump out the window and into the Mississippi because of an old lady (a monster) and her possessed dog (also a monster) thankfully we didn’t run into anybody like that. The arch is actually over a park so Percy wouldn’t have landed in the river. Finally, he wouldn’t be able to fit out the window because the windows are very small. I really enjoyed the arch. 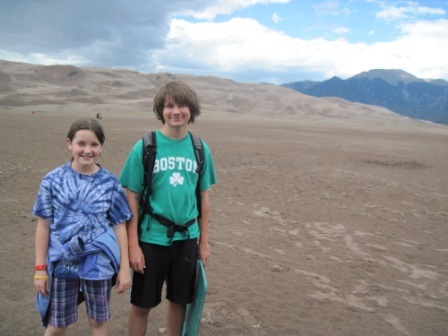 Today we went to Great Sand Dunes National Park. When we got there we went straight to the camp ground to make sure we got a site. After we set up our tent we went to the Visitor Center and watched the movie. We also asked the ranger if the creek was high enough to swim in. There was not enough water and it is full of black ash. So we did not swim. Instead we decided to climb the high dune. It was really hard because every time we put our feet down they slid a back couple of inches. It took us an hour and 20 minutes to walk the 1.5 miles to the top of the sand dune. They call it High Dune but it is not the tallest dune in the park. At the top of the dune the wind was blowing sand really hard and it hurt when the sand hit me. Going back down was easier. I tried to sled down some of the dunes on the food bin lid it did not work. I ended up rolling down the dune. After I climbed back up we walked back to the car and went back to the camp ground to eat dinner. Tomorrow we are going to drive for 12 hours. 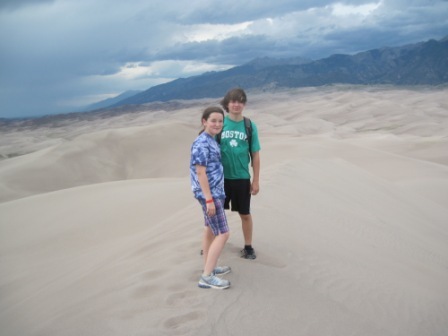 Today we went to Great Sand Dunes National Park. We got there and it started raining pretty hard so we hid in the tent from the weather. I sorted playing cards, Alex lay around and Mom took a nap. When it stopped we went to the Visitor’s Center to see what we should do. We decide to climb the high dune, a trail up to the second highest point in the sand dunes. The hike was definitely strenuous. When I took a step I’d sink and slide back two or so inches. My shoes were filled with sand so my feet were heavy. We brought a lid from one of our bins so we could sled; it was too flimsy so it didn’t work. When we got to the top, we had a wonderful view of the rest of the park, mountains, sand, and prairie. 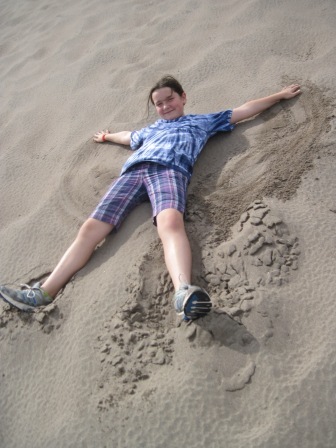 The top was really windy and the sand stung when it hit me. On the way back, I didn’t wear shoes and the sand was soft and fluffy. Let’s just say I had loads of fun coming down. 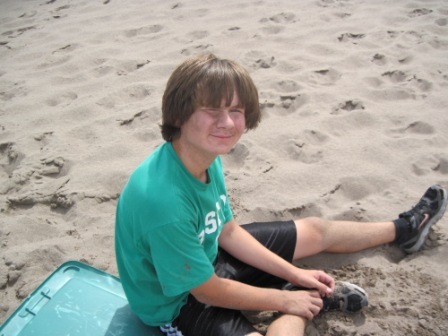 Alex tried to sled in the sand again but ended up rolling down and was covered in sand. We wanted to swim in the creek but it was full of ashes because of the brush fires. 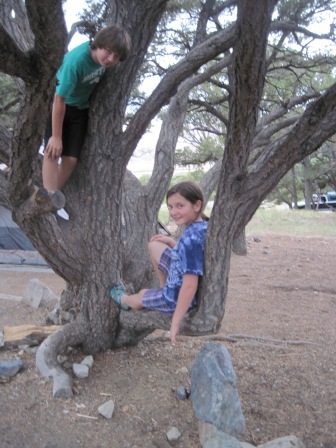 Our site was awesome; it had the best climbing tree ever so I ended spending most of my time in it. I even ate ice cream in it! I loved the sand dunes!